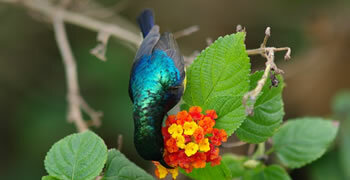 The park is known for a variety of wildlife lying in the northern part of Uganda. The park has got an open savannah where antelopes can be spoted in bigger numbers, the african Elephants, giraffes, warthogs, bushbarks, lions and leopards, the olive baboons and schools of hippos in the Nile River. A variety of unique habitats and lots of superb birds make a visit to this park a must for every bird watcher. The birding experience here greatly enhanced by the abundant multiplicity of habitats including savannas, forests, scenic landscapes and the marvelous waters of the Victoria Nile with spectacular Falls for which the park is named.